Rubble from the destruction of the Temple by Titus in A.D. 70. 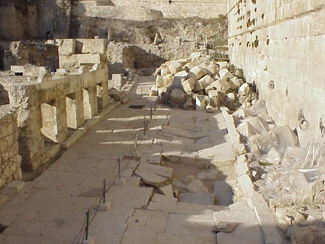 This area along the southern portion of the western wall of the Temple Mount (Haram esh-Sharif) wall have revealed Robinson's Arch, the street level and shops from the days of Jesus, piles of rubble from the Roman destruction of the Temple in A.D. 70, and an important Hebrew inscription. Benjamin Mazar began the excavations in this area in the late 1960's. Ronny Reich and Yaacov Billig have continued his work in recent years. For information see Reich, Ronny, and Billig, Yaacov. "Excavations near the Temple Mount and Robinson's Arch, 1994�96." Pp. 340�2 in Ancient Jerusalem Revealed: Reprinted and Expanded Edition, ed. by Hillel Geva. Jerusalem: Israel Exploration Society, 2000.